CHELSEA space is pleased to announce the latest exhibition in our 2015 programme, curated by Liz Ward, the former Librarian of Chelsea College of Arts. The collection was established in 1985 and has historical links with a number of related archives such as those held by the Institute of International Visual Arts (InIVA). Items in the archive date from 1970, with in-depth coverage of the 1980s. 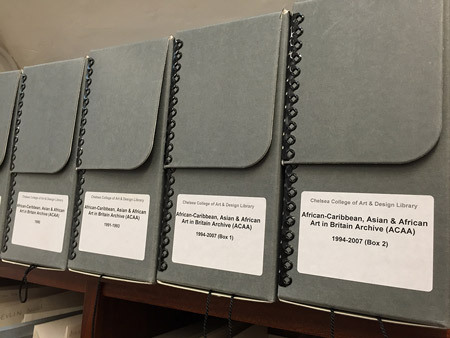 The African-Caribbean, Asian & African Art in Britain Archive was established by Liz Ward at Chelsea College of Art & Design Library thirty years ago to document the work of young Black British artists who were confronting the prevailing orthodoxies of institutional structures. This exhibition provides an opportunity to investigate the records of exhibitions and associated events that were produced at the time, and demonstrates the continuing importance of documenting the practice and theory of Black visual art. The structure of the exhibition relates in part to the publication Recordings, a select bibliography of African-Caribbean, Asian & African Art in Britain compiled by Melanie Keen and Liz Ward and published in 1996 by InIVA in collaboration with Chelsea College of Arts. Additionally, within the main exhibition there will be a display of ephemera, selected by Rahul Patel, relating to the specific exhibition The Devils Feast, and a rotating selection of other materials by the students from MA Curating & Collections.